Srinivasprasad is elected these polls, it will be a first victory for the BJP from the constituency where Congress candidates have won 12 times. 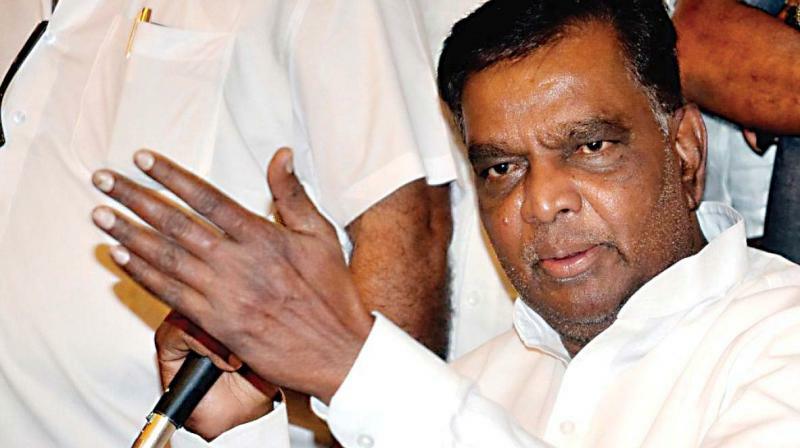 Mysuru: Neither his health nor his age seems to come in the way of prominent Dalit leader , 71- year- old V Srinivasprasad of the BJP, as he tries his luck once again from Chamarajanagar (reserved) constituency this Lok Sabha poll, taking on two term Congress MP, 58 -year -old R Dhruvanarayan. If Mr Srinivasprasad is elected these polls, it will be a first victory for the BJP from the constituency where Congress candidates have won 12 times, the Janata Dal twice, and the JD(S) and JD(U) once each. Mr Srinivasprasad has himself won four times as a Congress candidate from Chamarajanagar and once on a JD(U) ticket. He was still with the Congress till its last government in the state, when he was dropped from the Siddaramaiah cabinet and joined the BJP in anger. It is being said that you are contesting this election out of revenge against former Chief Minister Siddaramaiah for removing you from his cabinet and to defeat Mr R Druvanarayan, who was mainly responsible for your defeat in the Nanjangud bypoll of 2017. I am a BJP candidate and our focus is on making Mr Narendra Modi Prime Minister again. I am contesting under pressure from BJP leaders and because of the love of the people of Chamrajanagar. The BJP has never won from the constituency. Is there a Modi wave here this time? It is evident from the huge gathering at Mr Modi's convention in Mysuru and from the way the youth chanted, "Modi Modi." The BJP had enough support in the last assembly and parliamentary elections here. People have developed trust and confidence in the BJP. What difference do you see this time when compared to the 2014 Lok Sabha poll in Chamarajnagar constituency? In 2014, despite the Modi wave, Congress candidate, R Dhruvanarayan won with a margin of 1,41,182 votes because the Congress was in power in the state and the constituency had strong Congress leaders. I too was revenue minister and represented Nanjangud. My popularity was another plus point. We all worked together and got him a good lead. But now the Congress is weak in the state and Siddaramaiah himself lost in Chamundeswari in the last assembly elections. You represented Chamarajanagar for five terms until 1999. Do you still enjoy the same hold in the constituency? If that love and popularity that I earned over 40 years had not been intact, I would not have contested now. There has been very good response, the same love and affection everywhere. You are a strong follower of Dr B R Ambedkar and have a high regard for the Indian Constitution. But some BJP leaders are threatening to change the Constitution. Isn't being in the BJP coming in the way of your principles? There is no compromise with my ideologies. Sometimes in politics we need to make some "hondaanike "for some "horaata," but we don't have to do it at the cost of our principles. We can do it by sticking to them too. Has there been a single example during the past five years of the Modi government being anti- Constitution? The Congress claims your health and age will come in way of your performance even if you are elected now. My health is first class. With all my energy and enthusiasm I am trying to enter parliament for the sixth time.